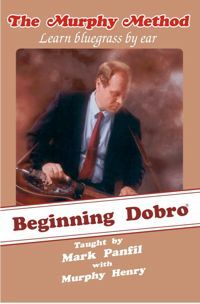 Beginning Dobro: The marvelous Mark Panfil demystifies the Dobro! And presents the most down-to-earth Dobro video on the market. As always, we start with the basics: how to hold the bar, how to wear your picks. Then Mark shows you a simple song to get both hands working together. Later he introduces slides, pull-offs, and hammer-ons and shows you how to play backup chords. Murphy joins Mark with her guitar during each lesson. Slide on in there! No Tab.